Answers to frequently asked questions about the Data Validation Multi-Select Premium (Data Entry Popup) product from Contextures. The On/Off Cell was not set up. Read the instructions below, to fix the problem. NOTE: Be sure that your workbook shows letters in the column headings, and not numbers. The DVMSP kit is designed to run in "A1" reference style (letters). In R1C1 reference style (numbers in column headings), list items might not appear, for lists based on a formula, such as INDIRECT. put the on/off cell on a different sheet. If you leave the on/off setting cell blank, the popup list might not run correctly, because it looks for a range named "0" (zero), which does not exist. if you DO want and on/off cell, replace the "0" with a cell address, such as "J3" -- then, use that cell as your on/off switch. 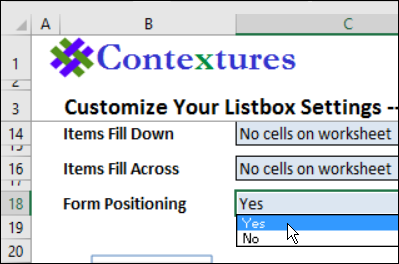 When you set up the data validation listbox in your own workbook, or in the Practice file, you might see an error, when you click on a data validation cell. 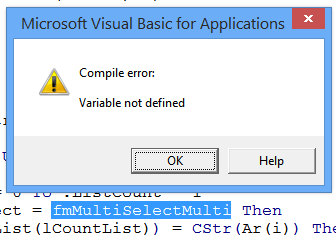 "Compile Error: Variable not defined." 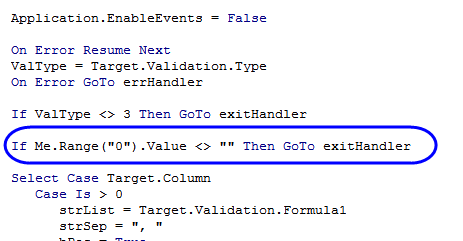 In the background, the VBA code is showing, and a word is highlighted. Click the Reset button, to stop the code from tring to run. Click the Tools menu, then click the References command. 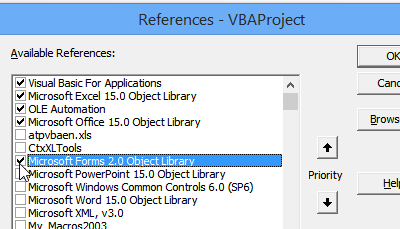 In the References window, scroll down to find Microsoft Forms 2.0 Object Library, and add a check mark to it. Click OK, to close the References window. The code should work correctly, without showing the error message. 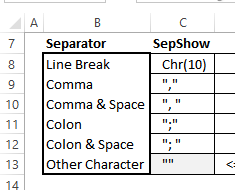 Before you add the data validation multi-select code, you must add drop down lists in the cells on the data entry worksheet. The lists must be based on named ranges, which are Workbook level. 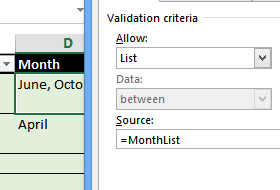 In the screen shot below, you can see the Month column's data validation list, which is based on the named range, MonthList. 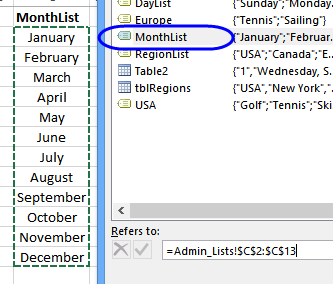 In the next screen shot, the Name Manager (on the Ribbon, Formulas tab) is open, and the MonthList is highlighted. DVMSP Kit Workbooks: The workbooks in the Data Validation Multi Select Premium (DVMSP) kit are licensed for one user, so files in the kit cannot be shared with others. 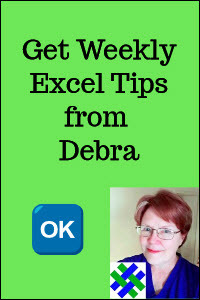 You can build an unlimited number of Excel workbooks with the kit that you purchased. Workbooks You Build With the Kit: If you use the DVMSP kit to add the popup list to other workbooks, you can freely share those workbooks that you created. Other people will not need the DVMSP kit, in order to use the completed workbooks that you built with your licensed copy. Type an apostrophe at the start of the line: "cmdOK_Click". That will change the code to a comment, so it won't run. Click the Save button, at the top left of the VBE window. Change the Offset numbers, to set the number of rows down, and columns to the right, that you want to move. For example, Offset(0,1) will move down zero rows, and 1 column to the right. NOTE: If you do not want the selection to move, type an apostrophe at the start of that line. That changes the line to a comment, instead of code that will run. In the DVMSP Setup file, you can turn the Form Positioning on or off, in the Customize the Code - Advanced step. If you select Yes, the code in the Popup List tries to position the top left corner of the form in the center of your Excel window. If you select No, the form should appear in the center of your Excel window. Press Enter, or click on the Popup List, to complete the move. NOTE: You can also press the Esc key to close the Popup Form. Right-click the sheet tab, and click View Code. Scroll down a bit, to the section that has a comment "where should code run"
Then click the Save button at the top left of the screen. If that doesn't fix the problem, there is also Form Positioning code in the Initialize procedure for the frmDVList. You can make an additional change to the code there. After you add the popup list to your workbook, you can adjust the popup form, to make it wider. Click on the form's border, or click somewhere on the grey background. Point to the handle at the centre of the right edge, and drag to the right, to make the form wider. Drag the handle on its right side, to mke the ListBox wider. 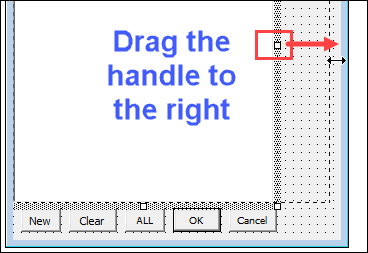 Then, click the Save button, and close the Visual Basic Explorer, to go back to Excel. In the DVMSP_Setup file, there are several built-in options for separators, and you can select any of those. Also, there is a sheet with a list of separators (Lists_Sep), where you can change any of the existing options, or add new options. The range of cells with the thick border is a named range, so be sure to insert your new item within that range. NOTE: Select a Separator that is not included in the items of your list. For example, if your items contain a comma or a hyphen, do not use those as separators. The kit is designed to open the list automatically, when you select a cell that has a data validation drop down list. Because the worksheet code runs every time a cell is selected, that can slow down a large, complex workbook. To speed things up, you can make a couple of changes to the code, so it only runs when you double-click on a cell that has a data validation drop down list. On the sheet where you pasted the code, right-click the sheet tab, and click View Code. Then, click the Save button, at the top right of the Visual Basic Editor (VBE) window. Using a double-click can result in one or two items being accidentally selected when the list opens. This occurs if the popup list opens over the cell that was double-clicked. To prevent this from happening, follow these steps to add delay code to the UserForm that contains the popup list. This locks the list for one second when the form opens, so items are not accidentally clicked. Click in the blank line just below that, and press the Enter key, to start a new line. Copy the following code, and paste it into the new line. This code locks the list, waits one second, then unlocks the list. This is the shortest delay time possible. The kit is designed for workbooks that do not have any existing macros on the worksheet. If you add the code to a worksheet that already has a Worksheet_SelectionChange procedure, an error message will appear when you click any cell on the worksheet. This can happen if you change the setup options in the DVMSP Setup file, and then add the code to the workbook again. If you want to make changes to your DVMSP setup options, delete the old code from the data entry sheet first. To see the code, right-click on the sheet tab of your data entry sheet, and click View Code. Scroll through the code, to see what is there. The DVMSP kit adds "Option Explicit" at the top, and a procedure named Worksheet_SelectionChange. That procedure has a comment at the top, "'show Listbox when a data validation cell is selected "
If that's all that is on the code module, press Ctrl + A to select everything, then press the Delete key to clear the sheet. If there are other procedures on the code module, do not delete those. Then, go to the DVMSP Setup file, make the changes to your customization options, and click the button to copy the code into the new workbook. If there are duplicate procedures on your data entry sheet, follow these steps to try to fix the problem. Scroll through the code on the sheet, to find the two procedures that are named Worksheet_SelectionChange. Check the code in each procedure, to see if it is from the DVMSP kit -- that procedure has a comment at the top, "'show Listbox when a data validation cell is selected "
Before you change the code, make a backup copy of your file. 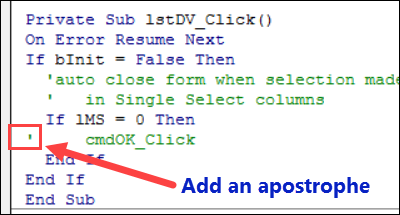 If both copies of the Worksheet_SelectionChange procedure are copies of the DVMSP code, press Ctrl + A, to select everything, then press the Delete key to clear the code module. If there is non-DVMSP code on the sheet, see the section below. Then use the DVMSP Setup file to customize the code, and to install it again. After you delete the duplicate procedure, things should work again, without showing an Ambiguous name detected error message. If the other copy of the Worksheet_SelectionChange procedure has non-DVMSP code in it, you would need to combine both the DVMSP code and the non-DVMSP code into one Worksheet_SelectionChange procedure. This kit does not include assistance for modifying your existing code. You will need programming skills, or help from a programmer, if you plan to integrate the DVMSP code with existing code on the data entry sheet. If Excel hangs or crashes when the popup list opens, the problem is usually caused by the named range where your list of items is stored. If that named range includes an entire column, that's over a million rows, and the popup list can't process that many items, so it hangs or crashes. If possible, keep your list in a named Excel table, and the list will expand or shrink automatically, if you add or remove items. You won't need to include any blank rows at the end of the list, for future additions. If the popup list does not show any items, it's usually because the macro can't understand the name that was used for the cell's drop down list. This can occur if the cell uses the INDIRECT function to create a dependent list. This feature works when the column headings are letters (A1 ref style), but does not work if the column headings are numbers (R1C1 ref style). Be sure to use the A1 Ref Style when using the INDIRECT function for your drop down lists, to avoid this problem.